The first port is placed at the lateral edge of the rectus muscle, between the level of the umbilicus and the transpyloric plane (which lies approximately half-way between the xiphisternum and umbilicus, Fig. 2). The peritoneum is entered under vision with sharp and blunt dissection. 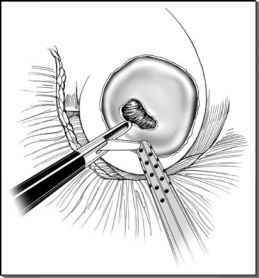 In patients with a history of previous abdominal surgery, particular care should be taken when opening the peritoneum, and the surgeon should introduce their index finger into the peritoneal cavity to sweep any abdominal wall adhesions prior to introducing the trocar.